Set your own header image. This may help you to add a logo to the page or just add a bit of your own color. Although this was available for some time now, in WordPress 3.0 it has been further improved in that it allows you now to choose from a predefined set of backgrounds, so now you have a gallery of header images to choose from. Currently the theme comes with an alternative header image besides the default one, that shows a WordPress logo in the header, to show ’em some love. More to come in the near future. Absolutely love the layout, flexibility and options. Do wish it was easier to change the hue/color scheme. I see I’ll have multiple PNGs to edit as well as CSS overrides to put in place to change it if I tire of, or don’t want to use, the brown/tan scheme. I love this this and for my site, it was perfect with very few tweaks (I can see where others might want to tweak the colors, but the colors worked for me). The built-in options covered pretty much everything I needed to adjust. Thanks! It’s a wonderful theme. I just happen to install this theme on one of my blogs. The layout of different sections like headline, Featured, Popular, latest, and the footer are pretty impressive. Just installed this on http://www.MexicoMO.com. Very impressive! I love the look and feel. Thank you! Hi – I have used this for a shared blog site Glooblog (not for profit) where techies and gadgeteers can share and learn. Would love you to comment or submit content, and thanks for the template – it works really well. Can you comment on what the latest release has before I upgrade? Nice website. I’ll be looking around. The latest release fixes some bugs for custom background, custom header and some template functions. If you haven’t done any modifications to the theme should be perfectly safe to update. Just installed your theme and love it; just I can’t see the thumbnails. I read the “thumbnails” post but can’t figure out how to do it. I’m moving my .com wp site to a .org multi-author site, and this is perfect. Thanks for including the header & background upload options! I am using this themes on my site. And I have some trouble. Figure, which is in publications, is not shown on the homepage. Thank you. Yes, I like your customization. Does the theme block trackbacks? I made posts on some other sites with trackbacks to the posts on my blog, but have not seen any trackbacks show up. I know that those sites send trackbacks as I have done that in the past. Thanks. May the other sites changed their settings. I use it for my site and its really nice. I love this theme — using it on my site right now. Thanks for making it! Where do I donate? Then I replaced “headline” with a slide? Or add a slide as well? I have getting very slow load times since I started using this theme. Love the theme but is there something I can do to speed it up. Very Slow (3.007 Seconds), 84% of sites are faster. I have seen lots of beautiful theme these past few days as I was searching for a theme that would fit my blog. As for me, abstract is the best. Maybe because it describes my personality. And also those themes with not too much slices are the best. I don’t find it messy. Hi, I really like the Cover WP theme but will need the post format functionality for my blog. Any timeline on when this will be integrated in? There are no plans to implement this feature. Thanks for the design! I really like it and am using it on http://www.lakeshoretrailrunning.com. Very nice theme and easy to configure..
TQ so much for great themes. Love the theme. I use it on my main blog, dimagemaker.com. One wish I had is for post formats as it would be really nice to support the aside format. Apart from that I love it. Maybe. The theme is planned to be updated soon. Will test it, and if it satisfy my expectations – I’ll use it in the next redesign. I was unable to logi on the support forums so I must ask here. How to change the size of the font in the first box on the right side panel, so they can be as big as the rest? the theme is very good. The interface is very beautiful, look very comfortable, next time you have a new template, I must be the first one to try. thank you. Beautiful theme. I am very fussy about my themes and usually design my own using Artisteer. I’m so pleased with this one, I’m contemplating moving some of my other sites over to it! I really like it. Most magazine styles have too much going on on the front page unless you have a news style site that you are constantly updating with heavy graphics. This has a nice simple clean look to it but is more interesting than a plain chronological posting list. A good balance of simplicity with features. Where do you actually download this theme? You have a download link at the beginning of the post. Thanks Daniel, but I’m missing it somehow. 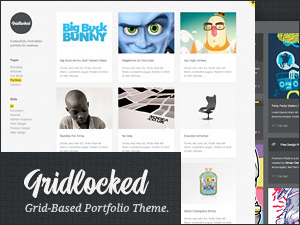 The beginning of the page begins with a link to download a theme called Gridlocked. The rest of the links in the post appear to be anchor links that nav down this page. Nothing I’m clicking is actually initiating a download. Any plans on updating this theme with new features? As the update in the post says, the theme is discontinued. It may be revived as a 2.0 version at some point but while it will resemble the look and feel of this one it won’t be backwards compatible with it. 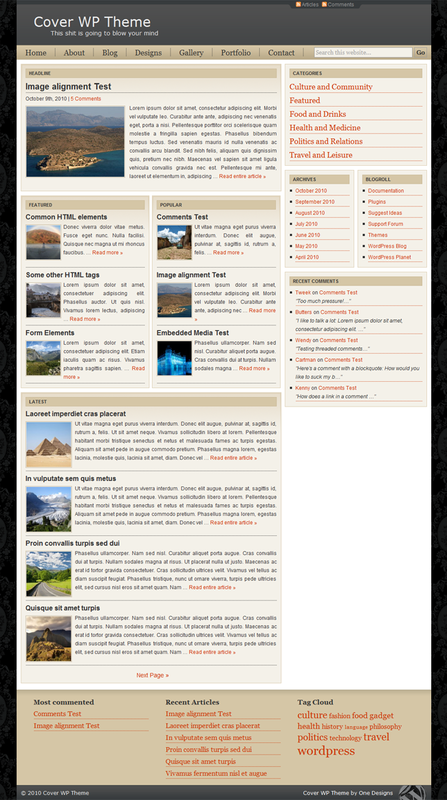 This theme was designed in 2009 and discontinued in 2012. It was pretty good back in its days, but now it’s past its time. You are welcome to check out our newer and more feature-rich themes.